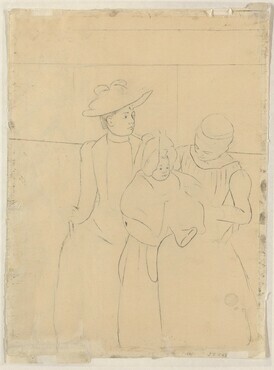 Mary Cassatt 1844-1926, National Gallery of Art, Washington, 1970, no. 85, repro. Master Drawings from the Collection of the National Gallery of Art and Promised Gifts, National Gallery of Art, Washington, 1978, p. 101 (as Tramway). 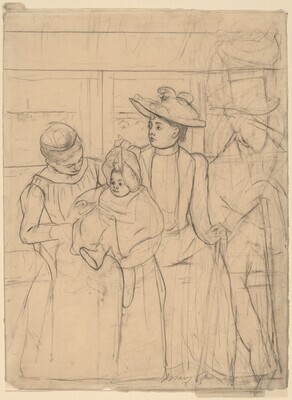 Mary Cassatt: Modern Woman, The Art Institute of Chicago; Museum of Fine Arts, Boston; National Gallery of Art, Washington, 1998-1999 (shown only in Washington). Breeskin, Adelyn Dohme. Mary Cassatt: A Catalogue Raisonné of the Oils, Pastels, Watercolors, and Drawings. Washington, DC: Smithsonian Institution Press, 1970, no. 804. Fine, Ruth E. Lessing J. Rosenwald: Tribute to a Collector. Washington, DC: National Gallery of Art, 1982, no. 88. Walker, John. National Gallery of Art, Washington. Rev. ed. New York, 1984: 680, no. 1096, color repro., as Tramway. Mathews, Nancy Mowll, and Barbara Stern Shapiro. Mary Cassatt: The Color Prints. New York: Harry N. Abrams, 1989, p. 116, fig. 7-1. Brown, Clint and Cheryl McLean. Drawing From Life. Fort Worth, 1997: 28-29, fig. 2.26. Mary Cassatt: Modern Woman. Exh. cat. The Art Institute of Chicago; Museum of Fine Arts, Boston; National Gallery of Art, Washington, 1998-1999: 83-84, repro. Søndergaard, Sidsel Maria. Women in Impressionism: from Mythical Feminine to Modern Woman. (Exh. cat. Ny Carlsberg Glyptotek, Copenhagen, 2006-2007). Milan, 2006, no. 182, not in exhibition.